These cultures contain a variety of pigments in different combinations, making them perfect for a focused study of colored algae. Cultures include Anabaena (chlorophyll a, phycocyanin, allophycocyanin), Bactrachospernum (chlorophyll a, carotenoids, phycobilins), Spirogyra (chlorophyll a and b, carotenoids, xanthophylls), Synedra (chlorophyll a and c, carotenoids, xanthophylls), and Vaucheria (chlorophyll a, c, and e; xanthin). 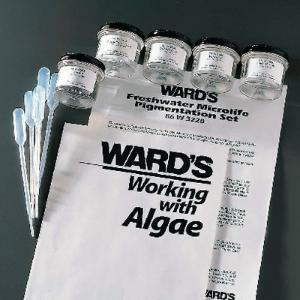 The set of five also includes the Working with Algae manual and materials for 35 students.